Coupons can be a great money saving tool when used correctly. Other times, coupons can actually make you spend more money if you aren’t careful! Several years ago, I followed the “Extreme Couponing” trend. It was fun while it lasted, but it didn’t last too long. You can read my article The Dangers of Extreme Couponing to see why I stopped. I still have a passion for using coupons at the grocery store, but my passion has changed over time and the way I use coupons changed, too. Grocery expenses are one of the biggest monthly expenses in many households. Depending on the size of the family, grocery budgets cost families hundreds of dollars a month. I’ve always heard that a good budget for a family of four is between $400-$600, but I know of larger families that are able to knock their food budgets down even lower than that! Coupons are one great way to knock down the total of your grocery bill. 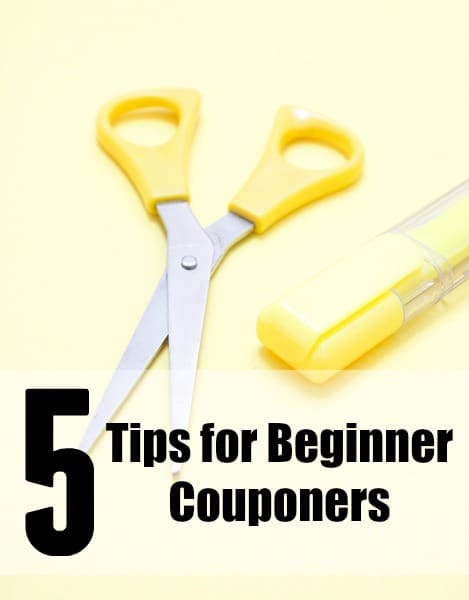 If you are new to couponing or if you are looking for ways to improve your couponing skills, here are a few great tips to follow. 1. Print coupons found online. My top 3 favorite go-to place for printable coupons are Coupons.com, RedPlum, and SmartSource. If you aren’t a fan of ink costs, I suggest using refill ink if you are going to print a lot of coupons. Refill ink is very inexpensive. I also recommend setting your printer to “Black and White” and “Quick Print” to save money on ink. 2. Find coupons on brand websites. You can often times find coupons to your favorite products on brand webpages. If you follow a certain brand on social media, you may get updates when new coupons are released. 3. Write to your favorite companies for coupons. Some companies will send you an envelope full of coupons if you ask. There are companies that will reply that they do not send out coupons, but at least you’ll know after you try. 4. Ask family and friends to save coupons. Ask your family and friends to save coupons for you when they come across any if they aren’t into using coupons. You could even have coupon swaps where you swap coupons you don’t need for ones that you do need. 5. Don’t Use Coupons Just Because You Have Them. Coupons can actually cost you more money if you aren’t careful. By this, I mean that just because you have coupons for items doesn’t mean you have to purchase that item. My best advice is to use only coupons on products that you know you need and buy on a regular basis. Now that you know where to find coupons, you’ll want to organize them. I recommend a small accordion file that fits in your purse. These are easy to carry around and have on hand when you need it. However, the one drawback to these is that you find yourself searching and flipping through coupons at the store because they are in a big clump by categories. If you have 50 coupons in your frozen food section, you find yourself wasting time trying to find the coupon you know you have in that stack! You can see that I organized it like this: Personal Care/Medicine, Cleaning/Household Supplies/Pets, Meat/Dairy, Sauces/Dressings/Condiments, Canned Goods/Soups, Pasta/Rice/Seasonings/Crackers, Beverages, Flour/Baking/Oil, Cereal/Breakfast Foods, Frozen Food/Bread, Paper Goods/Baby/Containers, Desserts/Snacks. The front section was reserved for store coupons. If the accordion style does not work for you, you can organize your coupons in a coupon binder with plastic baseball card protectors . You can see each coupon when you use a coupon binder. You flip right to the section, have a picture of what you are looking for, making it easier. However, the binder is bigger, cannot fit in your purse, and you do have to take it everywhere you go to get your maximum savings. You also have to be one that doesn’t care that people see you carrying a coupon binder around the store! You just have to ask yourself, “What is funny or embarrasing about saving money?! ?” You should be questioning those that give you looks why they don’t use coupons! To create your coupons binder, all you need is a binder that zips , dividers , and plastic baseball card sheets . You can always buy more of the dividers and baseball card sheets if you need them. It took me two hours to organize my binder. Once it is organized, it is very easy to discard the expired coupons and add new coupons. In the outside pockets of the binder, keep a pen, pair of scissors, and a calculator. In the inside pockets, keep store circulars, large coupons, and rebate forms. Keep a price book in the front of all sections so you can compare prices on certain items. 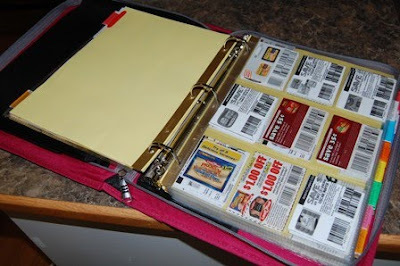 The first section of the binder is specifically for FREE coupons. The second section are for store coupons, including department store coupons and restaurant coupons. The third section is the food section divided up into these categories: Meat/Dairy/Milk, Cereal/Granola Bars/Bread/Cold Breakfast, Frozen Food, Snacks/Chips/Candy, Condiments/Sauces/Dressings, Pasta/Rice/Seasonings/Crackers/Baking, Canned Goods/Fruit Cups, Beverages. The fourth section is the Health and Beauty section divided into these categories. Toothpaste/Toothbrushes/Oral Care, Shampoo/Conditioner/Hair Color, Deodorant, Shaving Cream/Razors, Feminine Products, Body Wash/Soap, Make-up/Eye Care/Moisturizers/Face Wash, Sunscreen/Vitamins/Medicine. The fifth section is for household items and is divided into these categories: Diapers/Baby Wipes, Pets, Toilet Paper/Paper Towels/Paper Products, Laundry Care, Dish Cleaners, Multipurpose Cleaners, and Air Fresheners. I recommend taking a sharpie and labeling each page of coupons. For example, if you have a large Meat/Dairy/Milk file, write meat on a page and keep all of your meat coupons together, write dairy on a page and keep yogurt/butter coupons together, and milk on one page, keeping all milk coupons together. Remember: Do not throw your coupons away just because you do not need them that week! The key is to save them until you need the item and it is on sale. You can then pair the coupons with a sale, getting it for a very low price, or even free. Now that you have organized your coupons, it is time to put those coupons to use. Do you save money with coupons? So where are the coupons for milk and kirkland products? Costco has coupons, but they are rarely on things I use (every few months its litter and cat food,but nothing on the meats or dairy.) I've looked at the links and they seem great—for other people. I've gotten the paper & in the five inserts there was 1 coupon of a product we use. $3.75 for the paper & $1.00 off of 3 doesn't seem worth it. Other than writing to the companies and asking for discounts & samples (which I do) what else? If you are having trouble finding coupons for the items you like to buy, I would then take this step. Wait until the item you like is on sale. Then buy several and stock up. For example, we go through milk like crazy. Instead of buying one carton when I go to the store, I actually buy 6. (3 fat free for adults, 3 whole for child). You can do the same for something like apple juice. If you know Wal-mart has it on sale for $1.50 when it is regularly $2.00, buy several. Then it would be like using a few 50 cent coupons, when it's just on sale. You can check out stonyfield.com. They offer coupons on their organic milk. My advice is to keep looking and keep coming back to my blog to check the right side when new deals are posted. Hi! I love your blog! I found you through twittermoms. I also love to coupon but haven't been doing it very long and find your ideas very helpful. Great job! I recently stumbled upon your site and I am in LOVE! Thank you for all of the resources that you provide. I’m loving the WW menu based on the ads. Fantastic! I do have one question for you. I live in Iowa, so my grocery stores are totally different. Do you have any tips or site that follow the sales at HyVee or Fareway. That’s about all we have here other than Target and Walmart. 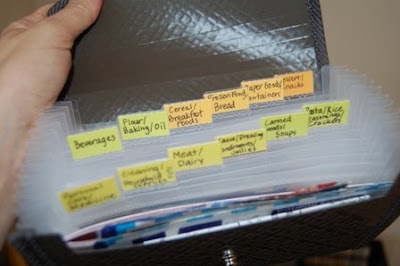 Thanks for posting this article about how to keep a coupon binder. We are thinking about creating our own, but we couldn’t figure out what kind of clear plastic sheets had dividers. Now we know that we can use the sheets that hold baseball cards. Thank you so much for this post. It is very helpful and we can’t wait to start our own binder. Hi! I’m new to coupons, but I’m eager to learn! I live OCONUS and our commissary carries limited items. I do not have access to coupons since we are not in The States, where can I go for printable coupons? Also, we are able to use coupons up to 6 months after they expire but I don’t know how to get a hold of old coupons. Got any advice? Thank you in Advance! I have started to do more couponing & getting free samples. You’ve given me some really good info & hope to put it into practice soon. I’m a totally clueless beginner. Thank you for the tips and great website! Good information…thanks! I’m going to take my take and read all of your tips. I really want to get into stretching my dollar—especially since there not so many of them these days. lol I’ve heard of ALL YOU and working on getting a subscription. For anyone interested who collect Coke rewards, for pts, you can get a FREE 1 yr subscription. love this!! thanks for sharing im always setting out to be this orginized hotshot couponer!! much fun!! These are great tips–I’ve been thinking about getting started, but wasn’t sure where to begin.